Every year, we anxiously await the announcement of the winner of MoMA PS1 Young Architects Program (YAP) -- the news means that cutting edge summer fun is just around the corner! This year's winning pavilion has just been revealed, and we are thrilled to announce that once again, a local firm has taken the top prize. 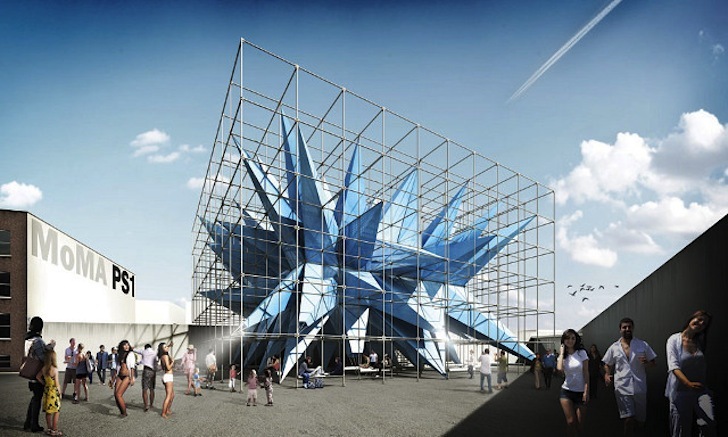 HWKN created a zany platform and pavilion called Wendy that combines water canons, air cleaning capabilities, and a massively cool, spiky-armed design. During its tenure at the courtyard, this incredible project will remove emissions equivalent to taking 260 cars off the road and will no doubt make the 13th Warm-Up music series one of the best yet. The temporary MoMA PS1 outdoor installations are expected to provide shade, seating, and water, and designs are judged based on their creative attention to sustainability, recycling, and space and material management. YAP jurors picked the project submitted by HWKN (Matthias Hollwich and Marc Kushner from New York) out of five talented finalists, and it’s easy to see why. "Wendy sits far enough away from the stage used for the annual Warm Up events to let the concerts go on unimpeded, but close enough to the entrance to create a filter and initial impact to visitors," writes MoMA PS1 in a press release. "It bridges over the walls into the large and small courtyards of MoMA PS1." The temporary MoMA PS1 outdoor installations are expected to provide shade, seating, and water, and designs are judged based on their creative attention to sustainability, recycling, and space and material management. YAP jurors picked the project submitted by HWKN (Matthias Hollwich and Marc Kushner from New York) out of five talented finalists, and it's easy to see why. Wendy, opening at MoMA PS1 in Long Island City in late June, tests the boundaries of architecture and only finds limits in shade, win, rain, music, and visual identity. The pavilion is covered in nylon fabric treated with a groundbreaking titania nano particle spray that actually neutralizes polluting airborne particles. In addition to its unique air-scrubbing material, Wendy features spiky arms that spray water and push out blasts of cool air and water mists that will take the edge off New York's hot and humid summers. “HollwichKushner's proposal for YAP 2012 is sure to make a memorable impression over the summer at MoMA PS1,” said Pedro Gadanho, Curator in MoMA’s Department of Architecture and Design. “It is iconic, but with a twist. By combining off-the-shelf materials and scaffolding systems with the latest cry in nanotechnology it is able to produce both an out-of-the-box ecological statement and a bold architectural gesture." Even visitors riding on the subway will want to venture to PS1 to see what the giant blue arms reaching about the courtyard's walls are all about. Wendy doesn't only establish a space, it generates an experimental, ecologically-sound environment bound to inspire one of the world's most creative cities. And that's what MoMA PS1 is all about.